A range of lightweight, , portable laptop stands that are designed to hold a laptop computer monitor at eye-level. The laptop stands are used in conjunction with an external keyboard and mouse to promote a more ergonomic posture when using a laptop. The laptop stands allow the user to adjust the height and angle of the laptop computer screen. They also have an inbuilt document holder which positions documents inline with the computer screen, which minimises the need for neck rotation and bending. The Ergo-Q2 and Ergo-Q3 are lightweight and can fold flat for transportation in a laptop bag. The Ergo-T is designed for "all day" use at an office desk. 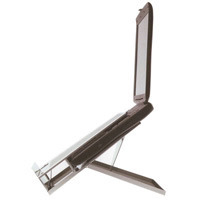 Model Bakker Elkhuizen Ergo Laptop Stands: Range of various laptop stand.